OrbicularisOculi: Wazdakka, Fastest of The Orks! 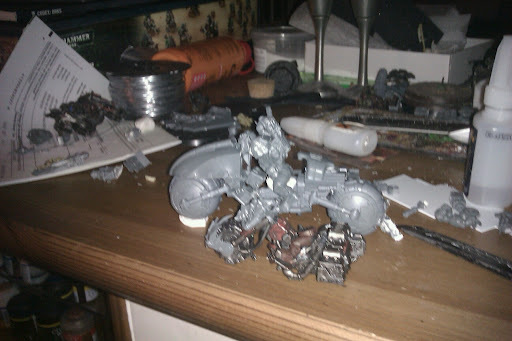 Wazdakka, Fastest of The Orks! Well, I've decided for something else than necrons in the campaign, namely orks. 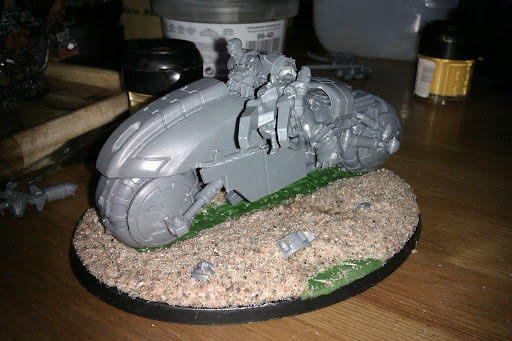 And not just any orks but Speed Freaks! A warband led by the speedy bugger Wazdakka gets warbikes as troops and after watching Akira last weekend (again...) I was inspired. Kaneda's legendary red beast was to be mine! 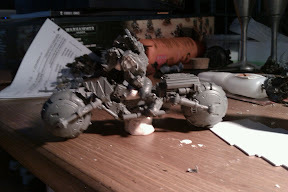 In orky glory! But since I have the attention span of a five year old on crack, my mek mind took me elsewhere. Tron. My boss wants a light racer so a light racer I will build! Only the dakkakannons and the boss left. Oh, and the base of course... and painting. And the rest of the boyz. I've got a lot to do. But Gork smiles upon me, so make it I will! And, of course, check out Irondog Studios. The place where I got the design for the Akira bike and owner of a genius bigmek mind. Even if you go the green path you'll appreciate his grandeur! Great work, and I love the base!